There is little particularly new in the November CEO’s report, but the overview scorecard on pp. 3-7 contains a distressing number of red “X” marks indicating targets not met. Some of these are collectively related to the shortfall in riding compared to budget (even though riding is up from 2015) and the various indices that this pulls down. However, many are related to service quality and vehicle reliability, and this is not the sort of thing one wants to see from a transit system that is in good shape. The TTC continues to suffer from aiming far too high for 2016 ridership with what was described at the time as a “stretch” target. That target allowed the TTC to show more revenue than it might otherwise have budgeted, but it also allowed service to be planned on the basis that it could grow into the budget headroom. This is a Catch-22 of TTC budgets because even a small miss triggers headaches at City Hall. A one per cent “miss” on the scale of any large corporation would be celebrated as good management, but for the TTC, that’s a shortfall worth more than 0.5% in property tax. Under normal circumstances “surpluses” from good years are banked in a reserve to fund the bad ones, but in 2017, the TTC plans to drain that reserve as one of many ways to limit its call for more revenue. Ridership numbers for August and September have been very close to 2015 values. For September, the count was 0.4% above 2015, and for the year to date, the total is up by 0.3%. The problem lies in the fact that the budgeted number is higher, and actual ridership is 2.6% below the budgeted value. PRESTO use continues to grow, but it accounted for only 3.26m out of 52.5m trips in September (6.2%). This quarter’s high score is driven by a perceived decline in delivery of a reliable service, which was driven by lower customer perceptions of the following criteria: trip duration on the subway, wait times on the subway and buses, and level of crowding on the subway and buses. The reference to “this quarter’s high score” is no doubt an editing error. On Line 1 YUS, the number of delays has been increasing since the beginning of 2016, although the total number of delay minutes is more stable. The charts showing this information suffer from having axes that do not begin at zero, and from data expressed as absolute values rather than percentage changes making direct comparisons difficult. The target is based on attempting a 10% improvement over previous year values, but there is no metric to compare values between lines, or relate the number and length of delays to the amount of service provided on each line. Moreover, the number of minutes of delay on lines 1 and 2 are both running above 2016, but the reasons are not broken down sufficiently to show whether “controllable” delays (those due to factors the TTC can influence such as vehicle and service reliability) are becoming less of a problem. There is reference in the text, but not a running history in the charts. Both lines are running below the scheduled peak level of service counted as trains/hour. This was particularly bad on Line 2 BD on August due to out of service trains with failed AC units. September brought better stats for both major subway lines, but they are still not meeting the target. This is an important consideration whenever the theoretical capacity of the subway network is discussed. When, eventually, automatic train control comes to the YUS, this will test the claims made for its ability to increase line capacity. Streetcar on time performance (measured at the terminals) continues to be very poor with only about 40% of trips leaving within the 6 minute window of “on time” (-1/+5 minutes) showing that even with that generous allowance, the TTC is unable to dispatch cars anywhere close to their scheduled times. This is compounded along routes because closely spaced cars quickly become pairs that travel across the city. There is no service metric to review this phenomenon, and the type of service riders see is much worse than that measured at terminals. Short turns have also stopped improving because we are now more than one year beyond the point where new schedules were in place on many routes. This is not a metric that can simply be improved year over year unless there is an aggressive attempt to change line management policies. Even then, short turns will never completely disappear, and the challenge is to use them only where warranted. Bus on time performance is better than on the streetcar routes, but this is partly the result of having many routes that do not operate in as challenging conditions. The TTC is not producing route-by-route stats for public consumption although this would give a better picture of what is happening. The aging streetcar fleet continues to be considerably less reliable than the bus and subway fleet. Mean distance before failure (MDBF) rates are worse this year for both CLRVs and ALRVs although they are at least stable. How these vehicles will hold up in the winter remains to be seen. With only 20 new streetcars in service, even a low number of defects can have a significant impact on the mean distance between failures. There is no question that if you flip a coin, there’s a better chance that you will get “heads” every time for five flips than for sixty, but the basic point is that a consistent run of values at similar levels (May to September 2016) is a trend. At some point, the numbers have to rise sharply to achieve the planned target. This is as troubling an issue for the new streetcar fleet as the delivery problems from Bombardier. The Capital Budget Variances detailed beginning on p. 57 list many projects where spending is above or below budgeted levels. Almost all of these are questions of timing whether they be project delays or deliberate choices to reschedule work. What is missing from this extensive list is any indication of whether the anticipated cost to completion remains on budget. This shows the folly of measuring burn rates against budge projections only for the current year and months rather than looking at the overall project status and flagging cases where a project is in trouble. The timing issue is important because the City and TTC have concocted a budget offset called “capacity to spend” that presumes that not all money budgeted in a year will actually be spent. 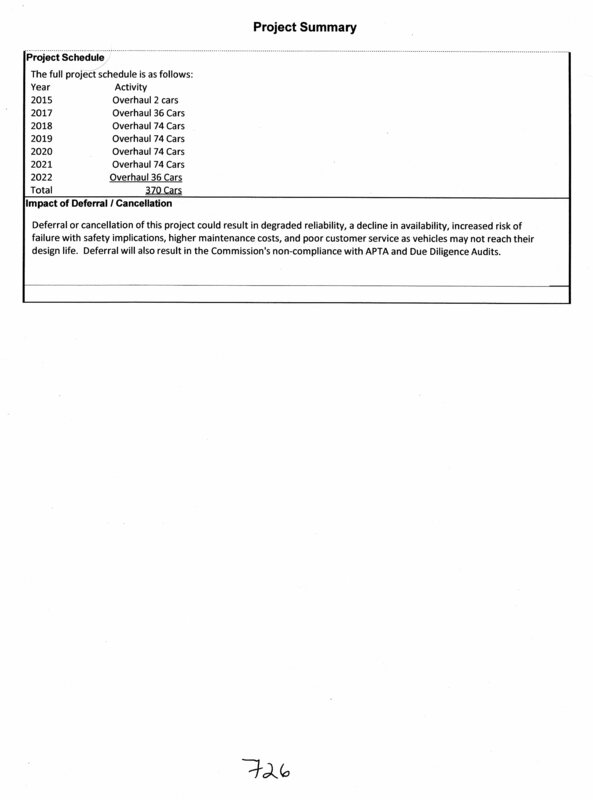 However, they are booking this as a permanent reduction in project estimates, not as a deferral. As the list of variances shows, changes of timing are the primary culprit. The Critical Projects section of the report is updated quarterly, and the next revision will come with the December report. The failure of air conditioning units on the T1 fleet (Line 2, Bloor-Danforth) in the summer of 2016 was a major embarrassment to the TTC which has prided itself on improved quality of service to its riders. The customer satisfaction ratings for 3Q16 took quite a hit primarily among riders of the BD, and the situation spoke to the dangers of leaving maintenance work too long. Replacement of the AC units was originally scheduled as part of the 20-year overhaul of the T1 cars, a process that is only just beginning given their age. 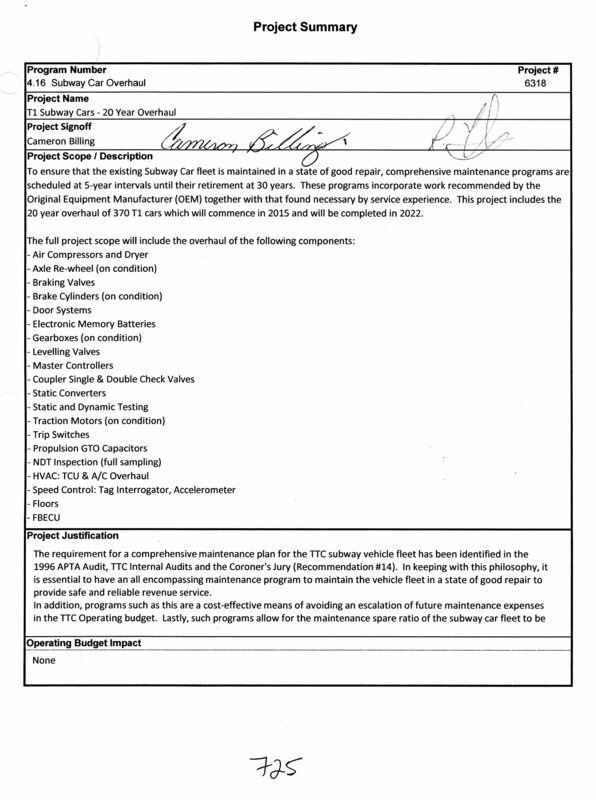 The components of this program are shown in the project summary below (from the 2016 Capital Budget Blue Books). The AC overhaul will be accelerated as permitting continued failure of units in service is simply not an acceptable way to operate the subway. The eventual replacement of the T1 fleet would normally occur when the vehicles reach 30 years’ age, but an earlier retirement may be in store thanks to the need for ATC (automatic train control) enabled trains to operate the Scarborough Subway Extension tentatively scheduled for opening in 2026. I will discuss this issue in a separate article on the Capital Budget. In a confidential report, staff recommends the acquisition of a property to increase the TTC’s garage capacity. There are no details in the public report and no new garage beyond McNicoll (scheduled to open in 2020) is in the budget. However, the Capital Budget does include a reference to property at 1810 Markham Road adjacent to Malvern Garage. (See Capital Budget Report at pages 16 and 26.) There is no money allocated in the 10-year budget to build a ninth bus garage. I will discuss Bus Fleet Planning in a separate article on the Capital Budget. Hillcrest is a large TTC property acquired when the public transportation system was founded almost a century ago. The lands were, at the time, on the northern edge of the city and home to Hillcrest Race Track from which the complex takes its name. Any large property is always subject to speculation (including by politicians looking to “monetize” public assets), especially one sitting in a very desirable area at Davenport and Bathurst. The south edge of the site is along a Hydro and rail corridor, not exactly prime territory for development. The Davenport frontage is occupied by an old garage that has not been used for bus operations for decades, and the Patten building originally constructed for the TTC’s Revenue Operations department. They decamped to a leased building in East York after the introduction of the new bimetal tokens added so much weight that the building could not sustain it. Relocation of the David Gunn Building is inconceivable as it is the main control centre for TTC operations. The Bathurst frontage includes the Inglis Building which once held much of the operational departments’ staff, although expansion through the years has spread them out elsewhere at Hillcrest and other buildings. (A separate study is underway of TTC office space needs with a view to consolidation, but it is unclear whether staff at Hillcrest would all be involved in such plans.) The Support Services Building (formerly the Personnel office) is a much smaller building just north of the main gate. Harvey and Duncan are the main shops for all surface vehicles in the fleet, although many Harvey Shops functions will shift to Leslie Barns as the TTC transitions to its Flexity fleet. Current usage is summarized below. The TTC along with a consultant will review all of the uses and functions for space within the complex with the intent of formulating long-term plans and identifying whether some of the property is suitable for redevelopment. Duncan Shops hosts the central maintenance functions for the TTC’s bus fleet. It was opened in 1987 to replace the much smaller Parkdale Garage on Sorauren Avenue. The building requires an updated ventillation system to deal properly both with the nature of repair work done there as well as to improve on working conditions that suffer from uneven heating. A number of bus hoists will be replaced and an overhead monorail crane will be added to provide access to bus roofs. With this type of investment, it is clear that the TTC does not plan to relocate this function, and indeed finding a suitable location would be difficult. Among the oldest of the TTC’s industrial facilities is the rail bending shed. 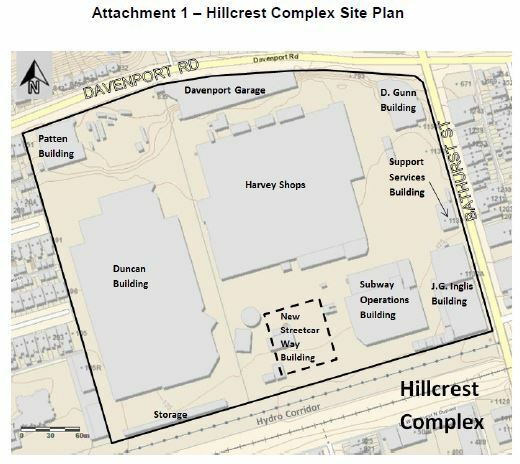 The proposed new building will not only improve the process it houses (bending rails for curves on the streetcar system), but it will consolidate functions now housed on trailers at Russell and Roncesvalles Carhouses, and will shift the special work assembly area from open space on the Davenport frontage to the south side of the Hillcrest site. This will free up space at the carhouses that will be needed when the new fleet is fully in place, and will consolidate staff from several locations to one. On a temporary basis, the functions now performed at Hillcrest will be relocated to leased property near the Unilever site on the waterfront to allow demolition of the existing structures and reconfiguration of the space. As a concurrent piece of work, a new loading dock will be built on the south side of Harvey Shops that will simplify deliveries to that building directly into its General Stores area. For drawings of the proposed changes, see Appendices A and B in the report. Davisville Carhouse was built for the original Yonge Subway which opened in 1954, and it was designed for trains that could be broken into shorter units. The building’s easternmost two tracks are used for washing and interior cleaning, but a full six-car TR (Toronto Rocket) train will not fit inside. This requires doors at both ends to be left open when a TR is in the shop causing heating problems and the possibility of freezing equipment during the winter. The TTC will extend the building at both ends for these two tracks. This may seem odd unless one refers to the building layout which is not the same length for each track (see drawing at Appendix A of the report). The Davisville site also includes a warren of overflow office and storage space in trailers along the southwest perimeter. It is unclear when these will be replaced with more suitable quarters. 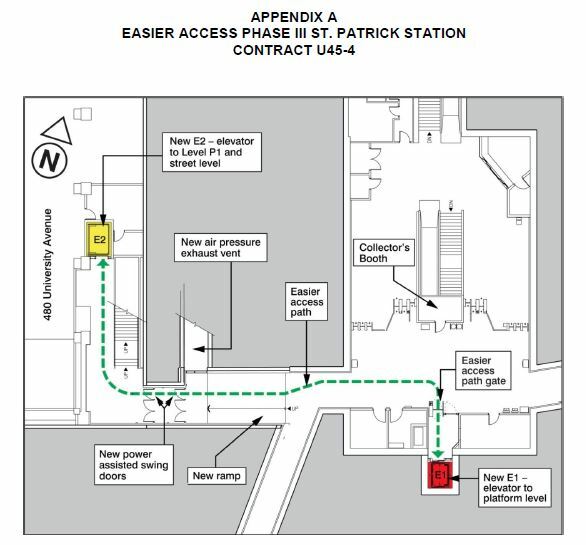 The TTC will provide accessibility to St. Patrick Station (Dundas & University) via two elevators. One will be located in a development on the northwest corner of the intersection linking from the street to the TTC mezzanine and to the building’s parking lot. There is already a similar configuration at Osgoode Station through the Opera House. The other elevator will run from the Mezzanine level down to the centre platform of the subway similar to the arrangement at Queen’s Park Station. The upper elevator and associated stair will replace the existing stairway to the northwest sidewalk, and that will become a ventillation shaft similar to those now at Queen (northeast corner) and Osgoode (southwest) where street stairways have been replaced with entrances through buildings. The lower elevator will be physically located under the south edge of the median on the north side of Dundas, an area that is currently open space with no fountain or statuary. Additional drawings are in the report. This entry was posted in Accessibility, Buses, Fares & Fare Collection, Finance, Service Cost and Quality, Streetcars, Subway Cars, Transit. Bookmark the permalink. I believe this will be the second extension to the Davisville car house in twenty years, yes? Steve: Yes. And just wait to see what happens if they buy 7-car, 500 ft long trains. Those extensions to hold 450 ft long trains won’t be quite enough. I’m wondering of the Harvey Shops building will still be needed once the streetcar fleet is converted to the new cars (if Bombardier ever manages to build them that is), and could it be converted to a streetcar yard, if another one is needed? Steve: Some of the bus work is done in Harvey Shops too. It’s not a hard split between Duncan and Harvey as the TTC’s description might suggest, but each does have a preponderance of one vehicle type. The question for a decade or so from now will be whether Harvey is ideal or should be replaced. Am I correct in reading the diagram that only tracks 5/6 can currently hold a full length train? If so, how do the other tracks 7-10 function effectively? Steve: Some of the space at Davisville has been used as a home base for the work car fleet, as well as the T1s used until recently on Sheppard, now replaced with 4-car TR sets. All that said, the site is far from ideal. This really won’t be sorted out until the TTC builds another yard to relieve its storage problems, and that’s likely to be southwest of Kipling Station. However, they don’t yet own the property. Has any thought been given to a reorganization of the fleet in terms of storage? When Vincent is operational could they not store work cars there or at Davisville (which needs continuous expansion evidently). I know it is not ideal but it is better than the alternative. I am sure if they shift things around it could make life all that much easier. Any idea why they do not store vehicles in the tails? I presume it has to do with the ability for operators to access vehicles? With the temperature about to plummet.. I wonder if the HVAC will fail again and turn riders into popsicles? Why freeze fares when you can freeze the ridership? Steve: I believe we may reach a point where some trains are stored in tail tracks, but not necessarily the first ones to go out in service a those are more effectively dispatched from yards. As for heating, that’s from a separate source than the AC, and so not subject to the same failures. Steve said: As for heating, that’s from a separate source than the AC, and so not subject to the same failures. As for storing of the trains I know that is part of their winter protocol so as to avoid a shutdown like we saw in 99. Store the trains in the tunnel to avoid trapping them in the yard. Steve: I thought you were refering to this as a standard procedure, not for storm conditions. I was referring to it as a standard procedure I was just highlighting the fact that in the winter this IS part of standard procedure. My point was that if they can do it in the winter they can do it during the rest of the year. I can see why they would not want to do such a thing but then again it does make sense especially on Sheppard where there are emergency exit buildings along with access at Welbeck to the tails. The only safe way to do it would be to park them at stations so that you do not have dozens of operators walking onto live tracks to board their trains which I believe is prohibited. For years now TTC has been storing 3 trains at Kipling Tail, 4 on Saturday nights, and 3 at Kennedy Tail. Even before the TRs came in. TTC also stores trains on the mainline in extreme cold nights. TTC plans on expanding Kipling tail for two extra trains, is there a completion date on that? Keele Yard is suppose to accommodate 6 trains plus work cars. Is there a reason why Keele Yard is taking so long? And I was going to ask about bus storage, but read that you will have a separate article on that. So I’ll wait for that. Steve: According to the overall project plan for subway fleet accommodation, Keele Yard isn’t scheduled to be complete until mid-2017. The contract was awarded to Century Group in September 2015. According to the report on the Davisville Carhouse expansion, Century bid on this work but is disqualified from any new contracts. This might explain the glacial pace of work at Keele. Perhaps they will be pro-active and account for this. Perhaps I’ll win LottoMax as well. Do you know what the new NovaBuses are replacing? Steve: It’s in the article’s update. I’ve always thought that Hillcrest would be a useful tertiary yard for streetcars. The 509-510-511-512 “belong” here. I wonder if they would make a car barn in the event that portions of the property (and associated services) were moved to other locations. . .
Steve: As things now stand, Leslie is big enough for the full 264 car fleet contemplated by the TTC (204 in the base order plus 60 in a followup order). The Hillcrest property is likely far more valuable for other uses, although the 7 Bathurst bus will continue to have utterly unpredictable service. It’s a shoemaker’s children sort of thing.